Vanilla Bing Homepage with No News! I like the Bing Homepage with the colorful pictures that change everyday, but do not like the news feed at bottom. Use the instructions at the following link to display a plain bing home page. If you use Internet Explorer to browse the web or are a web developer there are a lot of neat tools to be had at MODERN.IE (even the occasional free Pizza.) You can download a VM browser of any of the major browser makers or try a free 3 month trial on browser stack. Anyway for those uncooperative sites that refuse to work properly in IE try opening the F12 developer tools. 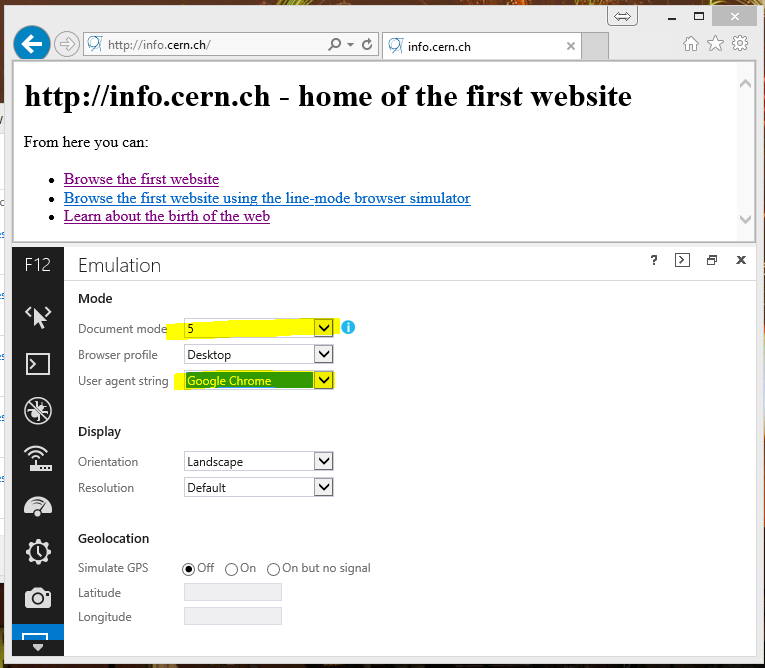 Now you can re-render the page in whatever IE browser you desire as well as change the browser headers to match any of the major web browsers. This could prove beneficial as well for the casual, but techie web surfer who comes upon a stubborn page. For interest’s sake I used the first website that ever existed to demonstrate the functionality.